Here's a new video from 2nd place (both PHRF A and overall - shortened course) winner VELOCITY. 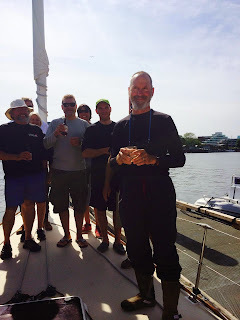 An intrepid crew member on Tom Keffer's J/42 used a GoPro camera to film their 2015 Oregon Offshore experience. Watch for an interesting perspective on the sail change procedure starting at 1:58, and we wish we were in on the joke at 2:40. Next year's theme is "40 for 40"; we're aiming for 40 boats (and more great videos!) for the 40th Oregon Offshore race. Let's make it happen! Velocity had completed the shortened course and reported a time to the race committee, but her reported time did not make it to the scorer's table. 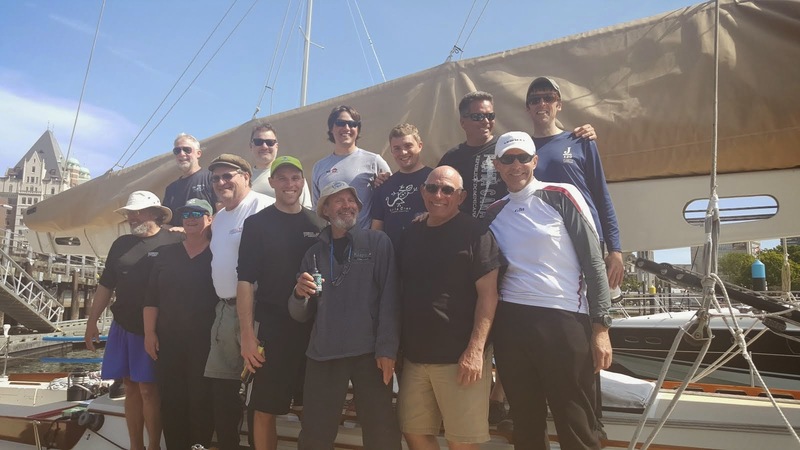 The CYC Race Committee regrets this error, and would like to recognize the crew of Velocity for their determination in finishing the shortened course. Per the SI's, Velocity will be awarded 2nd place in PHRF A. Congratulations, Velocity. Light winds on the Washington coast for the extent of the race became an exercise in patience, then ultimately disappointment for many racers, as the time limit made the finish line out of reach. One boat, Rage, managed to finish the course in the allotted time, and took home a collection of awards for her effort. In PHRF C, Evermoore showed extreme tenacity, gutting it out to complete the shortened course before the time limit and securing 1st place in her class. Don't forget... Next year is the 40th Anniversary of the Oregon Offshore. Put it in your calendar, and tell your friends! 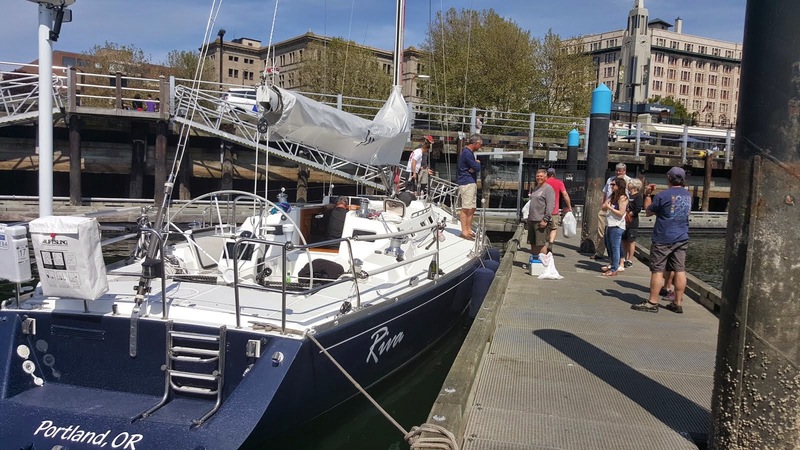 Skipper Rhys Balmer and the crew of Evermoore have reported their shortened course time and will be in Victoria in 9 hours. Good Race, Evermoore -- our smallest entrant, a Moore 24. Turnagain with Skipper Travis McGregor and Aja with Skipper Rich Elstrom both retired from the race this morning and are headed in. To be scored on the shortened course, skippers of boats in PHRF B and PHRF C must report their times passing Duntze Rock (as written in the SI's) by phone/text to 503-789-2463, or to Kevin Kahl at the awards ceremony. Times must be reported within 10 minutes of the shuttle bus arriving at RVYC. 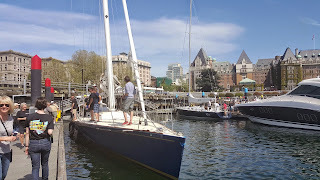 Thirsty and Velocity have made it safely into Victoria Harbour. The rest of the fleet should trickle in shortly, hopefully in time for the bus to the BBQ! Cool Change under the command of Captain Frank Noragon has decided to leave the race as of 00:45 with calm winds as the reason. Safe travels. We received word at 12:00 hours from Captain Pete Shainin that Passepartout has entered the Strait and is under power. We wish the Captain and crew safe travels as they return home. We still hope we'll see everyone tomorrow at the RVYC. Skipper Alan Bergen and his crew have moved Thirsty into the Strait and now have 15 hours to travel the 40 miles to the finish line. Can they do it? Will they make me get out of bed to finish them? Will Velocity challenge them? DON'T GO AWAY! This is going to get interesting before it's over. Happy Birthday, Rage Skipper Steve Rander!! 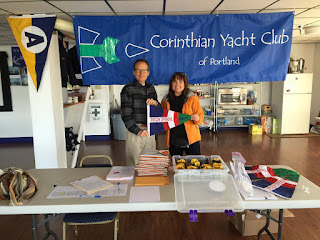 Longtime supporters/members of CYC Portland Jerry Barnes and Elaine Bock helping Rage dock. These two have done so much our club and we would like to say Hip Hip Hooray! to each of you who is helping make this race a success. Congratulations to Rage our 2015 Oregon Offshore First to Finish! Rage is in! Congrats to the first finisher of the 2015 Oregon Offshore. The crew is well-lubricated and happy to have completed another great race! Skipper Scott Campbell made the call early to abandon the race and motor up. Looks like it's proving to be a good call. We're glad they made it safe and sound. HELLLOOOO, race enthusiasts! It's beautiful here at the finish line in Victoria, but our racers are in a holding pattern off Cape Flattery without wind. We need help creating the wind with prayers, rituals, superstitious deeds, and semi-scientific procedures to help our racers. I've heard of such things as biting the heads off mackerels, sailors dancing in their undies, while others are brewing up some top-secret, special family recipe chili. We are currently doing our part by sending a crew to the end of the breakwater with a jigger of 10-year-old bourbon as an offering to King Neptune. Whatever it takes, we need to get our race boats into the Strait of Juan de Fuca by 17:00 to catch a favorable wind and tide. Riva withdraws saying "All is well, lack of wind and distance from finish is the cause." 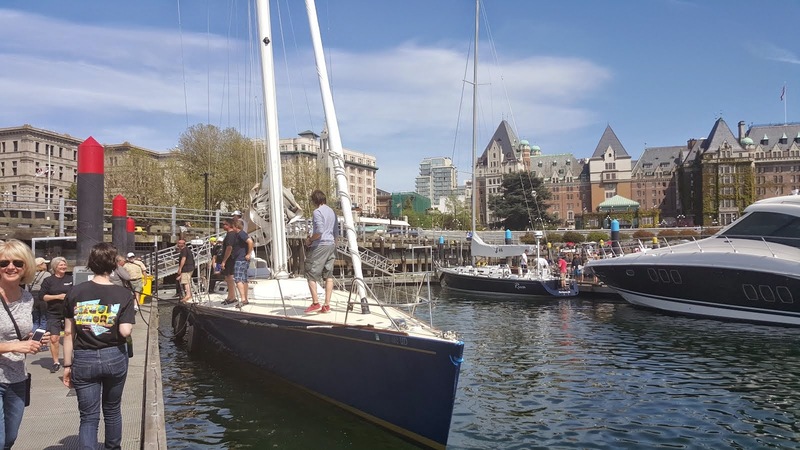 Skipper Scott Campbell and crew thank you for racing, the hospitality committee will meet you at the dock here in Victoria. The Oregon Offshore Race ends tomorrow, Sunday morning at 10 am. With 27 hours left in the race there will be a lot of pouring over charts determining time, speed, and distance to the finish today. 2000 hour and Rage has turned the corner into the last of the ebb current. If the wind cooperates we might see Rage at the finish line in the wee hours tomorrow morning. In a text to skipper Tom Kelly this afternoon to see if we could get a spot signal, Anam Cara officially withdrew May 8, 15:33, and is headed to Port Angeles. All is well except for Anam Cara's electrical system. We are sorry to see you go. Better luck in the Swiftsure. The Start Line Committee reports nice weather for the start, with a light breeze at about 10 mph combined with some current out of the north. Al 13 boats crossed the start line within a few minutes of the start gun but will have to work against the headwind and current to get North. The finish line received a text from Velocity this morning reporting they were off "Cape Elizabeth enjoying sunshine and muffins with little wind." I don't know if this message came from skipper Tom Keffer or one of the crew. They were having a debate amongst the crew as to which would be more effective to raising some wind, an offering of a muffin, or spirted horn pipe on the fordeck. I don't know, I'm more of a scratch the backstay kind of guy. Perhaps someone out there has a sure-fire wind raiser? The Strait of Juan de Fuca buoys are forecasting winds of less than 10 miles per hour for tomorrow, May 8th. Steve Rander may coax Rage into the finish on the 3 knot flood current, but any boat caught in the Strait at 7 pm will be facing a dying wind and a 2 knot ebb. It is going to be a long race for some of our Offshore fleet, so lets all keep our fingers crossed for some wind tomorrow. Long, beautiful drive this morning up the peninsula, meeting everyone on the ferry and exchanging towels and stories. Set up in the motel and the internet just in time to finish some guy from Norway. Columbia Crossings is proud to provide Portland area boaters with the area’s finest moorage facilities and easiest access to the excitement of boating on the Columbia and Willamette Rivers. 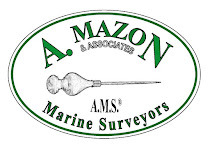 Their friendly, professional staff provide exceptional customer service and maintain a clean, safe and secure environment for you and your family to enjoy your boating experience and the variety of their facilities. Thank you to Columbia Crossings for supporting this awesome event year after year! We're now 5 hours into the race, and the boats have sorted out into their respective classes. PHRF A leads the pack, with Rage starting to leg out from the rest of the fleet. Riva is hanging in there, though. We'll see if Rage can maintain her 1+ knot speed advantage over her competitors. Turnagain and Thirsty are finding success nearshore, leading PHRF B. For PHRF C, Cool Change is leading her class as the inshore boats all head offshore, where Wy'East had stayed further out and looks to gain when the class consolidates. Report from the start line is all boats have started. We have one boat, Aja, which is failing to appear on the tracker website. We are trying to resolve this issue. Update 1: Aja is now tracking. She had been appearing as Cantata - their tracker registration numbers were swapped on the charting software. Unfortunately for Cantata, this means her tracker is not transmitting. Update 2: Word from Tracker HQ is Cantata's tracker transmission has not been received since it was tested yesterday. Cantata, if you're reading this, check your tracker! Update 3: It looks like Cantata's transmitter is now on. 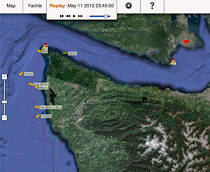 The whole fleet is now visible on the race tracker. Thanks for your patience while we sorted out a couple technical glitches. Schooner Creek Boat Works is the Pacific Northwest’s premier full service boat yard facility. 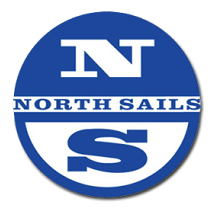 Established on the banks of the North Portland Harbor in 1977 by Steve Rander, what began as a small boat building and repair operation with a few dedicated craftsmen is today one of the largest and most advanced boat repair, maintenance and new construction yards in the United States. Today, the facility at Schooner Creek houses a full-service boatyard and boat building operation with the capacity to construct, service and store dozens of vessels indoor and out. Steve's wife Nancy is a long-time supporter and organizer of the Oregon Offshore. Look for Steve during the Oregon Offshore on his beautiful and fast Wylie 70, Rage. Thanks for your support, Steve and Nancy! Once again, racers' positions will be available at oregonoffshore.swiftsure.org. Those of us watching the race unfold from home while our loved ones compete often spend restless nights refreshing the tracker, cheering our favorite boat on to safely finish in Victoria. When the boat’s position fails to update, our minds can invent all kinds of horrific reasons for it. We want to remind you not to equate a tracker in distress with a boat in distress. There are several reasons why the trackers may not update, including a failure to communicate with satellites, an unsuccessful GPS fix, or battery failure. Often the crew are quite involved with racing and fail to notice when the tracker stops transmitting (pro tip: as a spectator, if you are prone to worry, ask your crew to regularly check the operation of the tracker during the race). In case of a lifesaving emergency, each boat is required to carry an Emergency Position Indicator Radio Beacon (EPIRB) or Personal Locator Beacon (PLB). Every crew member should be trained in the operation of this device. If a boat is in immediate need of assistance, a crew member will activate the EPIRB to coordinate a rescue. The US Coast Guard has issued a permit for the race and is aware of each yacht's participation in the race. This is just a reminder... the trackers are meant more for your vicarious enhoyment, and not to replace an EPIRB or PLB. Sit back and enjoy the fun from your armchair! Captains Cahen and Thompson are ready to check skippers in at Astoria Yacht Club! Please note the trolley will leave AYC at 6pm sharp to take crew to Rogue Brewery for the party after the Skippers' Meeting. The trolley will only run once, so skippers and one navigator should be sure to get to Rogue via another method of transportation for the meeting, which will start at 6pm. If you have no other method of transportation, let Darroch know during check-in, and we will try to help coordinate a ride. The good news is that the sailing instructions have been posted for your reading pleasure. Find them here. The other news is that we have an official start time of 1100 hours on Thursday, May 7. 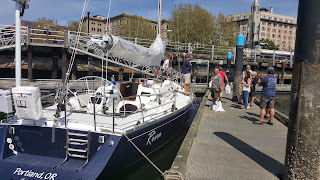 Don't forget to check in between 3 and 5:30 tomorrow, May 6 at the Astoria Yacht Club. After check-in, the skippers' meeting will be at Rogue Brewery starting at 6pm. As we polish the final details for this year's race, we want to bring your attention to another of the Oregon Offshore's biggest sponsors. 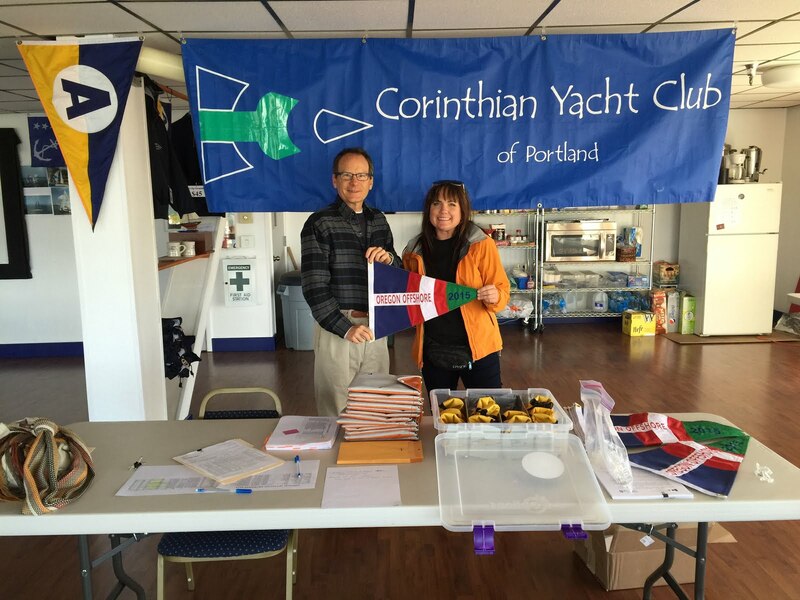 Attorney Jim O'Rourke will be racing on Wy'East this year, and took an interest in helping CYC make the 2015 Oregon Offshore another successful race. Jim has practiced as a criminal defense attorney and personal injury and wrongful death lawyer in Oregon for over 30 years, representing people in DUII, DUI, drug crime, property, measure 11 and other crimes and automobile injury accident and death cases. He works with an extensive network of Oregon professionals from various disciplines to provide effective legal representation for his many clients. Jim is also very experienced in defending Oregon health care professionals in criminal cases and board proceedings. This is a good guy to know! If you see Jim, be sure to say "Hi" and "Thank You" for his support of the Oregon Offshore!